From the very moment I picked up this read, I knew I was in for great treat. Page three completely had me at “My ghosts protected me. I could close my eyes again without any trepidation, turn over in my bed, and embrace the darkness, snuggling safely like a baby in the arms of her mother.” These are the words spoken by Sage that left me intrigued and yarning to learn more about this mysterious yet loving character. We learn early in this read that Sage isn’t your normal teenager. She sees things from her past in her dreams and she is not afraid to speak her mind about what she sees. In fact her adoptive parents are not fans of her gifts and often keep her from living a normal teenage life in fear of what may come out of her mouth. Sage is constantly wondering where her visions come from and if they are memories of her real mother? These are just a few of the questions Sage is in search of finding in this delightful read. Sage is a sixteen year old girl growing up in the small town of Dorey, Massachusetts who is struggling to find a healthy balance between home and social life. I personally feel sorry for Sage because it must be extremely difficult having the gift of seeing things and not being able to fully embrace it due to her over protective adoptive parents. In fact, Sage has visions that couldn’t possibly be from her lifetime. The drama in this read picks up when Sage’s parents decide to move her to a new school and she meets a new friend by the name of Summer Dante. After a few series of events, Sage suspects that her parent’s may know more about her past then what they are willing to express. I felt this way from the very beginning of this read because her parents especially her mother, seemed to be hiding secrets!! This is quite a quick read full of mystery, suspense, and questionable behaviors. I really enjoyed the way V.C. 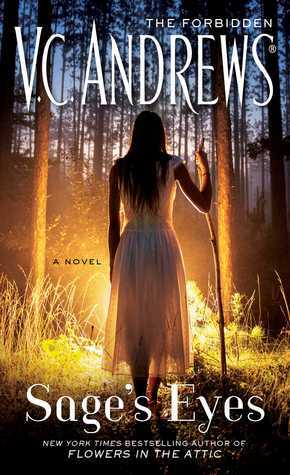 Andrews allows the reader to fully understand Sage’s desperation in trying to find out the reasons behind her visions. The read itself is semi-slow in pace and the real drama takes time in developing. I personally did not like the way Sage’s parents treated her more like a science experiment then as their own daughter. This is hard to take, especially considering the fact that they adopted Sage when she was only eight months. However, the story line is full of twists and turns that make you think and analyze every aspect of this read. Overall, I would totally recommend this book to anyone who is looking for a great read that will keep you intrigued and wanting more! Many thanks to the publisher and author for providing me with a copy of Sage’s Eyes in exchange for an honest review. V.C. Andrews died in 1986. Was this work written by a ghostwriter?